This blog introduces a new stack held together by Redux, that we like to call the 3REE (React + Redux + RethinkDB + Express) stack. It brings together all the technologies we have come to be amazed by and delivers a coding environment that, IOHO, is liberating and elegant. N.B A key motivator to writing this blog was sharing with the community an approach to tying everything together in a Redux app, from server-side rendering, async communication to connecting with React components. React is a library for building user interfaces. It is a declarative approach to building the view layer of your application. You build up a hierarchy of React components that each encapsulate certain parts of your UI. For a quick and dirty intro to React I quite like this blog post by Andrew Ray. Released in June 2015, Redux has gained a lot of traction, quickly rising to become the 2nd most popular Flux architecture, behind Facebook's own implementation. The graph below highlights this, by showing the number of stargazers on Github over time for each of most popular Flux architectures in the wild. For an in-depth introduction to Redux go check out the docs - it is an incredible resource, and a tribute to the dedication of the main contributor, Dan Abramov! RethinkDB is an open-source distributed database that stores JSON documents. It has been built with a strong focus on developer experience. RethinkDB's docs provide a great launchpad for a hands-on introduction to the database. Express is a Node.js web application framework. Its focus on minimalism allows you to build your server layer in a simple and flexible manner - perfect for this stack. It is one of the more common frameworks used when developing a Node.js application. Talking about a stack without a code sample would be pretty lame so I've created a repo on Github containing the source code to a demo application called Pulse. 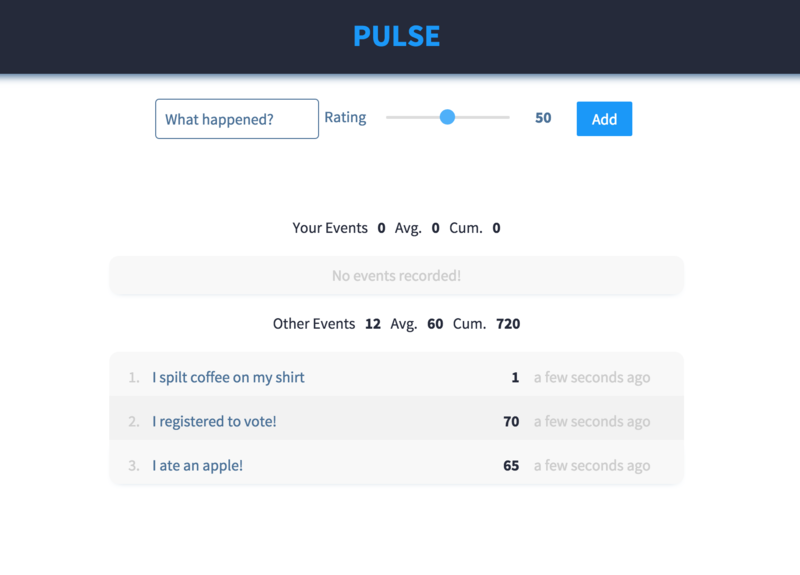 It allows you to record events, and rate them. You are also able to see other people recording events too. You can see the application in action here. I'll walk through some snippets and highlight key parts of the stack. With the 3REE stack we can do this pretty easily, thanks to Redux and React. By retrieving an initialState from our service layer, creating our store and then calling React.renderToString with our main React component, we can render straight from the server! We make initialState available to the client-side application by setting a global variable in our index template. We then reference this our client-side code to bootstrap it all up. Integrating communication with a RESTful API has been one of the areas of the Flux architecture that has been an area of mystery. Documentation and concrete examples have been thin on the ground. However with Redux, the docs does a great job of explaining how to approach this using redux-thunk. We use this approach combined with superagent, an client + server HTTP request libary to support all HTTP verbs. By using the redux-thunk middleware we can write action creators that return functions when we want to handle asyncronous flow. Below is an example of how we create an addEvent action, and in turn, addEventRequest and addEventSuccess or addEventFailure. You can see in the source code how this action creator is passed down as the onSubmit prop in PulseApp.js to the EventInput component. There is no noticeable difference when calling the action from the view layer, you invoke the function just as you with any syncronous action creator. RethinkDB's changefeed API was originally launched in early 2015 to help the database integrate with other real-time systems. However, they quickly realised that they had created a solution to the broader problem of pushing real-time data to your application/client. With the 3REE stack we can leverage this functionality to power real-time updates to an application. In our demo app we have a section devoted to 'Other Events' that updates whenever another user of the application adds an event, this is powered by RethinkDB's changefeeds. On the server side, when our server has started we call a function, as shown below, that sets up our changes feed from RethinkDB. Whenever a change is detected we emit a message using Socket.io to each of our connected clients. You may recall from an earlier snippet the function call setupRealtime(store, actions). This sets up Socket.io on our client side application that listens for any changes that are pushed to the clients. In this snippet whenever an event-change message is received we inspect the object in the message to see if it is for a new event being added., if it is and it is not owned by the current user, then we dispatch an addEventSuccess action. This results in the UI updating and showing a new event has been added by another user. We've gone through a quick overview of the key aspects of the 3REE stack and what can be acheived when bringing all these technologies together. N.B If you'd like to contribute to improving the repository, please get in contact, post an issue or make a Pull Request!